Yesterday all thoughts of indoors were abandoned, including posting a photo. Instead I took a train to the seaside resort of Bexhill, on the southern coast of England. There I was able to indulge myself in the typical British seaside experience, stony beach, freezing water and some lovely fish and chips on the beach for lunch ... shared with the seagulls. Nice capture of the scene on he beach! In answer to your question at San Francisco Bay Daily Photo, "Louis" doesn't meter himself - he's still learning the new Nikon Mme la Vache brought him from her trip to Japan. He's used the Nikon in automatic mode and it's done the work on those shots of the sun. "Louis" regrets he can't give you a more technical answer. Seems like a great way to spend an afternoon! Great pic, love the composition. Sounds like a perfect Saturday, well except for the freezing water. 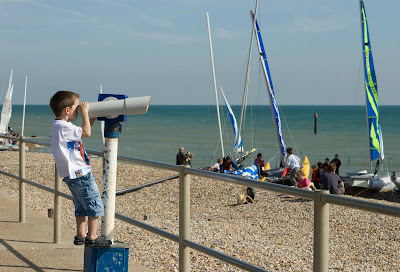 I love this photo ....especially the image of the boy looking out to sea. Glad you took full advantage of the Indian summer. It has been long awaited sunshine, but worth the wait this weekend. I wonder what he sees out to sea? It makes a nice shot.